If you are a bit of tech nut then you need this bodysuit for your newborn. It is a bodysuit that comes in pink, green, blue and white and in sizes from 0 – 24 months. And on the baby bodysuit it shows a loading bar like we are use to see on our computers. Above the bar it says “Diaper Loading….” and below the bar it says “Please Wait”. Don’t know if you have to wait long before that diaper is full but the bodysuit is funny. Come check out this Diaper Loading Baby Bodysuit. Geeks are born and if you are a geek then your of spring will likely be one to. To make the world aware of what you are teaching your baby you should have a look at this bodysuit. On this bodysuit you see the word Geek in a 8 bits font and the words “in training” and there is also a mouse pointer. This all makes it a fun printed piece of baby clothing. And this bodysuit comes in a range of colors in long and short sleeves and will fit babies from 3 – 24 months. 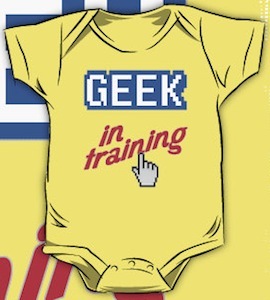 Get your baby ready to become a geek and start with this Geek In Training Bodysuit.